Lindsay, a certified Speech-Language Pathologist, earned a bachelor’s degree from Ohio University in Hearing Speech and Language Science and a master’s in Speech Language Pathology from Nova Southeastern University. Lindsay began her career as a graduate student clinician at the Joe DiMaggio Children’s Hospital in the Cleft Palate and Craniofacial Center where she performed evaluations, provided group treatment and led a phonological (articulation) awareness treatment group for school-aged children with language and learning impairments. Her clinical work continued while working in an intensive autism classroom and outpatient clinic, where treatments included articulation, social skills, expressive and receptive language, augmentative and alternative communication and behavioral strategies. 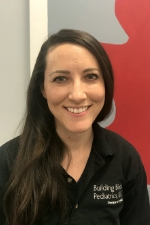 Most recently, Lindsay has worked at a skilled nursing facility working with geriatric patients following illness or injury, including traumatic brain injury, stroke, knee/hip surgeries and other related issues. Lindsay is skilled in evaluations and diagnostic testing for dysphagia (swallowing), cognitive, language and speech deficits. When Lindsay is not working, she enjoys international travel, walking The Beltline, cooking and eating her way through every restaurant on Buford Highway.